For most of the past 150 years, baseball groundskeepers literally “leveled the playing field” by using string lines, wheelbarrows, and hand tools. A smooth playing surface with the correct slope ensures true hops for the players and also allows water to run off the field. 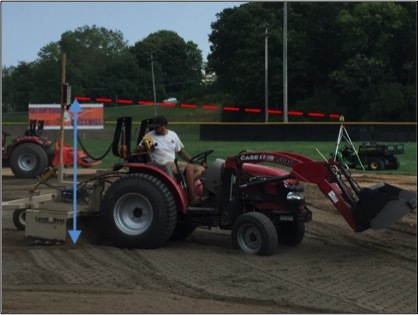 Manual leveling of an infield is still effective, but this process is slow, labor-intensive, and not practical for most parks and schools. Fortunately, laser grading now provides a rapid and highly exact solution to infield drainage problems. Many folks we work with complain that their infield will not drain (Figure 1). I like to politely remind them that infield soils are not designed to “drain,” at least not in the vertical sense. A quality infield soil contains too much silt and clay to transmit water down through the profile. Instead, water must flow off the surface by following gravity- this is where laser grading comes in. Figure 1. Infield skin areas are not designed to have excess water percolate through the soil. Standing water on this infield should be addressed by adding infield mix and laser grading. Proper laser grading satisfies both these conditions. The basic idea is that a tractor towing a laser-guided box blade is driven over the field, cutting high spots and filling depressions until the infield exactly conforms to the desired slope. If used properly, the laser guided blade is much more precise than the human eye, hence the title of this article. The nuts and bolts of this process are far from rocket science, but do require some thought and careful operation. Here’s how it works: first, our crew conducts a survey of the field’s existing elevations to determine which type of laser to use. A rotary laser is a device which projects a beam of light while spinning at several rotations per second. 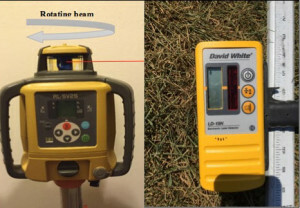 The light beam can be detected by a receiver and rod marked in inches or feet (Fig. 2). Once the survey is done, we decide whether to use a cone laser or a dual-slope laser to grade the field. Figure 2. Rotary laser (left) and laser detector mounted to rod marked with inches and fractions (right). The preferred grading plan for baseball and softball fields uses a cone laser. This laser is placed at the center of the field, from where it projects an invisible cone extending in all directions. (Figure 3). The slope can be set to any desired value. This field design allows water to travel the shortest possible distance before exiting the skin. Figure 3. Top: Infield graded with cone laser, showing equal slope in all directions. Bottom: cross section of field (not to scale) showing linear distances and vertical elevation changes. Occasionally a field will have its high point in the center, but with different elevations along the grass edges. If this type of field were to be laser graded as a symmetrical cone, the infield skin will not conform or “tie in” to the existing grass edges. However, as long as the center of the field is the highest point, the projected cone can be tilted slightly to “split the difference” between the two slopes (Figure 4). 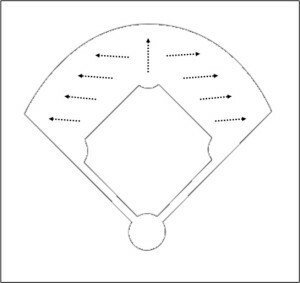 This grading plan works well when the existing field contours are similar to a cone but need a slight adjustment. The example in Figure 4 shows a field where the right side is lower than the center but higher than the left side. In this case the slope on the cone laser would be set to 0.75% (the average of 1% and 0.5%) and its axis tilted toward the left side of the diagram. This produces a “true slope” which conforms to both sides of the field. Figure 4. Top: Infield graded with tilted cone laser. Center of field is highest point with slope in all directions. Length of arrows denotes degree of slope in each direction. Bottom: cross section of field (not to scale) showing linear distances and vertical elevation changes. Vertical arrow from laser indicates a standard cone setup; angled axis indicates tilt required to achieve conformity with existing grass elevations. 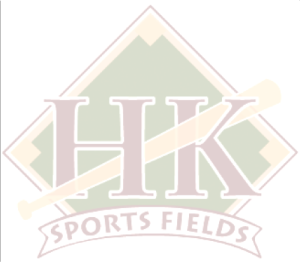 Often times, the field was not built by a sports field-specific contractor Many general contractors simply construct skinned infields with the “lay of the land;” that is, sloped from one side of the field to the other. This is called sheet draining. Sheet draining is the least preferred grading method because water must travel the furthest distance across the skin. A cone laser cannot be used on this type of field without total reconstruction of the sidelines and a portion of the outfield. Fortunately this situation does not preclude the use of laser grading: enter the dual-slope laser. Rather than a cone shape, a dual-slope laser projects a plane which can be rotated to create any desired 3-dimensional orientation. It is called a dual-slope laser because it has two axes (slopes), both of which are adjustable. To visualize how this laser works, pick up a notecard or a piece of paper with both hands. First raise and lower you right hand. This simulates adjusting the x-axis of the dual-slope laser. Now rotate the paper away from your body- this simulates adjusting the y-axis. By setting both these to the proper values, the laser creates a plane which will conform to the existing sheet drain. 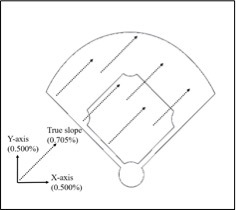 Figure 5.Top: Infield graded with dual slope laser, showing sheet-drain grading plan. Bottom: cross section of field (not to scale) showing linear distances and vertical elevation changes. A dual slope laser can also be used to “parcel” a field into smaller sections. This grading plan works well when home plate is the high point. An example is shown in Fig. 6: the field is split in half. 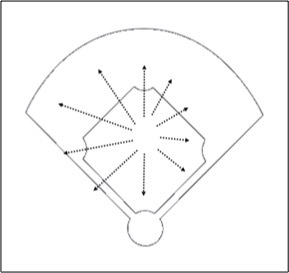 Starting at home plate, there is downward slope both toward center field and also toward 1st and 3rd bases. To visualize how the laser projects this grading plan, examine the cross section in Fig. 6. Hold your pencil horizontally with the tip touching the high point in the diagram. Now raise the eraser without moving the tip. The pencil depicts the y-axis while the x-axis can be oriented to match the left or right half of the field. This type of field requires water to travel further than a cone-graded field, but it is still an improvement over the sheet-drain type field because the water has less distance to travel before reaching the grass. Figure 6. Top: Infield graded with dual slope laser, showing split sheet-drain grading plan. Bottom: cross section of field (not to scale) showing linear distances and vertical elevation changes. Once the laser is set to the desired slope, a receiver is mounted to the mast on our tractor. This receiver communicates with the laser to raise and lower the grading box, cutting and filling soil as needed. Figure 7 illustrates this process. After grading, the infield will exactly mirror the invisible surface produced by the laser ~8 feet above it. Even with a cone or dual-slope laser set up properly, it is rare for an existing field at a public park or school to have grass edges which tie in perfectly to the laser’s shape. This is why laser grading is not “idiot-proof,” as some in the industry believe. Like all computers, the laser-guided equipment can’t think for itself. The laser grading box will do exactly what it is told, even if the directions are wrong! Therefore the equipment is only as useful as the person telling it what to do. If left on automatic mode near the edges, the box blade will usually try to either cut the skin below the grass level or leave a sharp drop-off from the skin over the last few feet. After laser grading 95% of the field, the operator must manually over-ride the computer at the end of the grading process in order to taper the skin down to the grass and create a smooth transition. This ensures good drainage and player safety. Figure 7. Operation of laser-guided grading blade. The electronic controls raise and lower the box as needed. The computer keeps the distance from the laser beam to the ground surface constant despite the contours of the uneven ground. 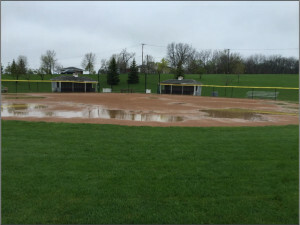 Does your infield collect water after a rain? Do surface undulations reduce playability and cause bad hops? Has the skin developed high and low areas from dragging and field usage? 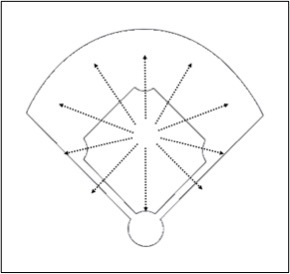 These are signs your infield would benefit from laser grading. Contact us for a free site assessment- we can provide the laser-grading solution for your field. Remember, the laser doesn’t lie!